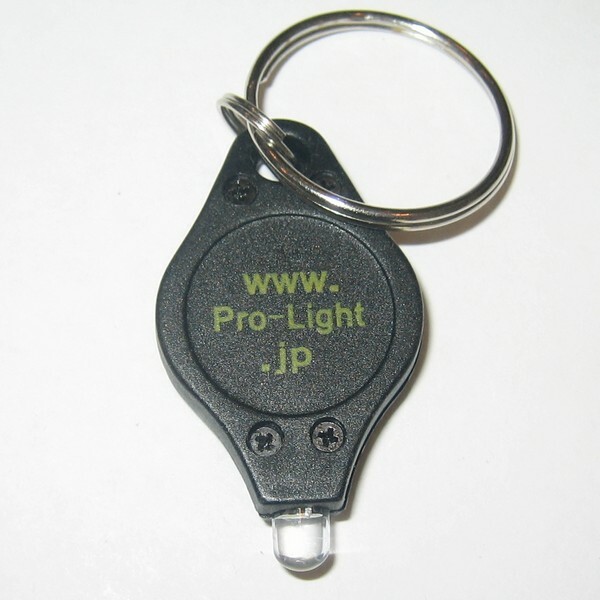 This is a keychain light with the same size, case and interface as the common chinese Fauxtons. The difference is that these lights have an improved SMJLed as the led. The SMJled is a lot brighter than the regular 5mm leds found in similar keychain lights, it is comparable to the output of an ARC-AAA premium. The lights are powered by CR2032 lithium coin cell batteries they are splash proof but not water proof. Both the led and the case will resist wear from keychain use and impacts. To activate you just squeeze the light for momentary activation or use a small sliding switch for constant on-off operation. An improvement over the common keychain lights with extra brightness but without any extra features as those found in the Photon Freedom. You can get them for $7 from Light Hound. AG Russell Titanium Lockback folder. 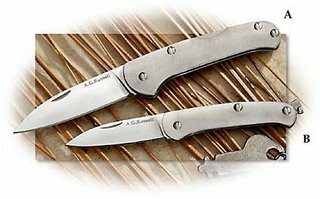 This is a top quality keychain knife from AG Russell, the handles are made of titanium and the blade is VG-10 steel. The knife is only 2.5 inches long with a 1-7/8'' satin finished blade. It weights just 0.5oz. The locking mechanism is a lockback located in the middle of the handle, it is very solid. This little knife can be carried in a keychain, a pocket, a coin pocket or inside any pouch, it is really small and thin. When opened the blade is good to do most typical cutting jobs, rope, cardboard, nylon, plastic and other common materials can be handled without damaging the blade. There is no hole for a split ring or attachment the knife comes with a small and nice real-leather pouch that has no holes either!, so the carrying options are inside a pocket or drilling a hole through the leather pouch and inserting a rivet. It fits great inside coin pockets of jeans if that is an option to you. If you are looking for an excellent and very small titanium knife this is a great option. It costs $25 and you can read more or order from AG Russell's website.